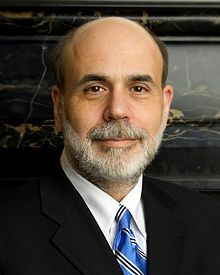 Ben Shalom Bernanke (born December 13, 1953) is an American economist of Jewish descent. He was the Chair of the Federal Reserve, the central bank of the United States. ↑ Phillips, Matt (October 6, 2015). "Bernanke: I'm not really a Republican anymore". Quartz. Retrieved October 9, 2015. ↑ Grunwald, Michael (16 December 2009). "Person of the Year 2009". Time. Retrieved February 4, 2011. This page was last changed on 3 November 2017, at 19:21.